Hubber Dubber Do – spring is sprung, birds, bulbs and buds abound! This month we can tell you that there have been major developments in store. Its not finished yet – the final touches are on the way but it’s definitely time to share some of the excitement! Let’s start with the power section that is the boss’s office! This fabulous bird in a floral wilderness now resides on one entire wall of Taryn’s office. It is a wallpaper panel from Miss Lolo and its certainly eye catching! It makes those discussions with the boss so much more fun! And let’s face it, isn’t it time for some colour to give a lift to all that beige, grey and greige! The new black wall shows our collection of shutters to perfection. A great alternative to blinds or curtains in almost any situation – so much more cost effective than a trip to the Bahamas…. Just call for an appointment and our consultants Janette and Brenda will be delighted to share their expertise. 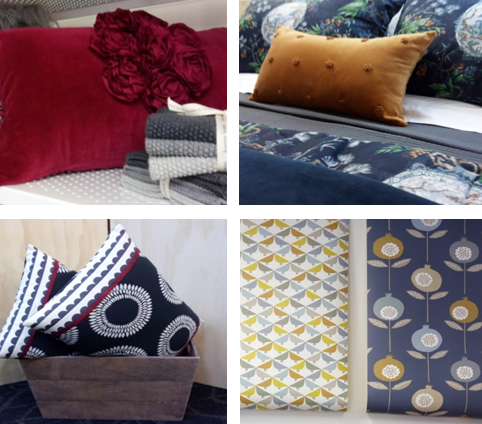 The curtain ranges have been extended - linens, velvets, colourful prints, voiles or embroidered sumptuousness for your own boudoir, it’s all here. Several of the fabric houses also have wallpapers and there is a large selection of wallpaper books available for you to browse. But wait there’s more - cushions from Kushinz. Our very own Betsy makes these unique pieces dotted around the store as well as made to order. Bianca Lorenne linens are available from Lile Interiors – Kim is based at Hubbers and will happily discuss your requirements by appointment. And rather importantly there’s flooring …. 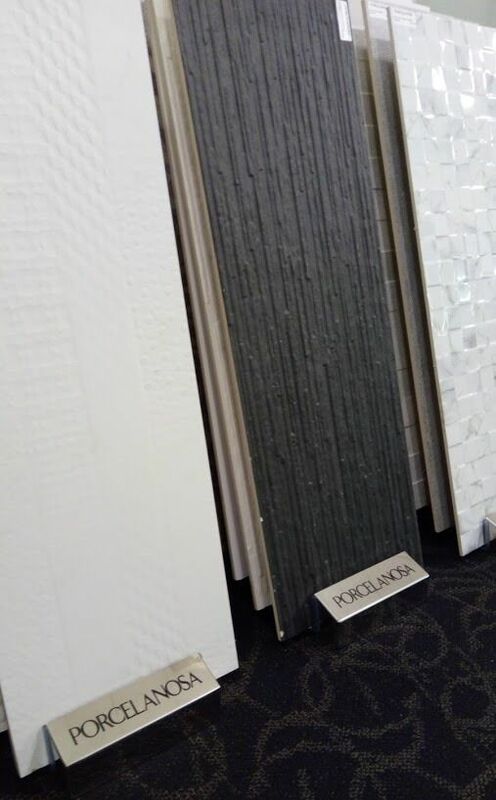 These beautiful tiles from Porcelanosa in Spain are truly fabulous. Offering texture and beautiful architectural shapes they give a wonderful lift to a shower or a chimney piece. The multi patterned tiles are very popular for bathroom floors and can be seen in all the latest interior magazines. Carpets woven from beautiful natural renewable wool through to serviceable manmade fibres including solution dyed nylon, polyester, and triexta. Colours are mostly muted but there are also some more exciting shades starting to appear which would be great for rugs.